The South Carolina backcountry is no place for a young girl to grow up in the 1760s, but sixteen-year-old Emily Stewart wouldn’t have it any other way. She loves the settlement of Ninety Six where her father Breck Stewart runs a tavern with his family, including Emily’s embittered older brother, Donnan. But there’s much to fear, too. Gangs of murderers, thieves, and robbers terrorize the country with impunity. Pleas to the government in Charlestown fall on deaf ears. 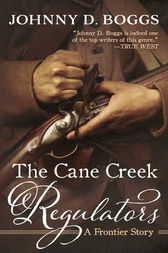 As the savagery continues, Breck Stewart is finally forced to take a stand, forming a vigilante group called the Cane Creek Regulators. The settlers take the law into their own hands—even though such an act will be considered treason and could land everyone riding with the vigilantes in a colonial prison—or on the gallows.